Finally we went to Adventure Playground in Huntington Beach. After years of hearing about it and never going I decided to go opening day. When does Adventure Playground Huntington Beach Open? Adventure Playground is open this summer on June 19th until August 18th. This is a must on your bucket list for Things to do in Southern California. Hours are from 10am - 4pm, remember traffic! So I would leave at 2pm unless you live nearby. Lucky you! Please note that it is closed on Sundays and 4th of July. 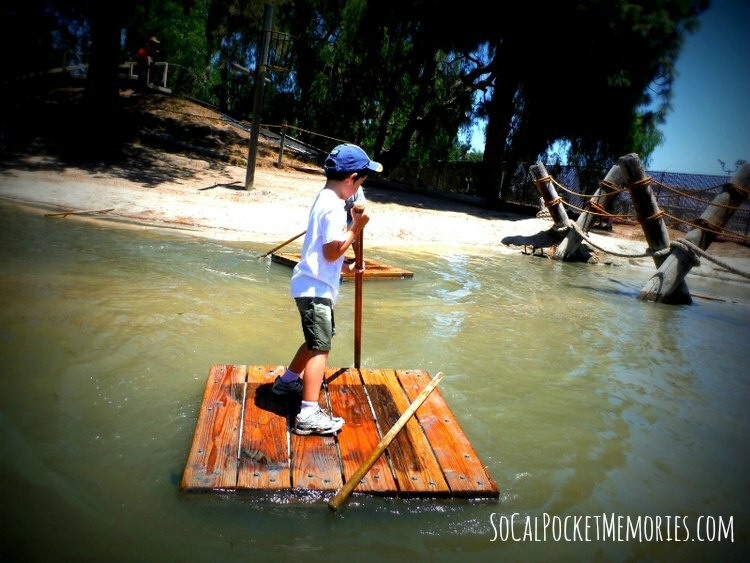 Where is Adventure Playground Huntington Beach? Directions are head south on Beach from the 22 or 405 and then make a left on Talbert. Talbert ends into the parking of a park and library. Once you pull in on the 2nd aisle make a right. Go all the way through the parking lot and park on the right hand side when you see the hill. From your car you will be able to see the sign of Adventure Playground on your right. Once you park follow the path up the hill. How much is Adventure Playground Huntington Beach? Once inside you will find a trailer/office. Cost is $3 per child and Adults are FREE! There are rules and the staff will explain to your kids what they are. Most important is that you have a pair of sneakers. If you don't have an old pair I would suggest going to the Thrift Store. They have old sneakers that you can borrow just in case you forget them. We arrived at 10am and we had the place pratically to ourselves. The rafting was everyone's favorite, including myself. They allow two people on each raft. At first I had to carry my toddler cause he was uneasy, but once he got used to it he was directing me where to go. The water is not deep. Went up to my knees at times I had to get off to push the raft cause we got stuck. The balance ropes are right next door. Rules are that kids must go in one direction and no horse playing. If they fall off they are able to just get back on. Even my toddler did this. Please note that the ropes will not be open this year again. They also have forts that you can add to! They let you have a hammer and three nails or a saw! Kids under 8 years old must be with an adult. They have tons of wood and so here I was helping the kids build. I started the nailing process and they finished up. Then they were intent on finding old nails to get more nails. There is one fort that was under the shade that was nice for us. The favorite was the Mudslide! This is not open all of the time. When you arrive they will tell your kids that when they see a someone in a red shirt on top of the hill it is open. The staff sprays each kid as they are coming down with a hose. Kids loved it! Save your trash to exchange for more nails! There are benches for you to eat lunch or you can bring a blanket and sit outside on the grass. The bathrooms are porter potties and they have changing rooms that somebody made. I changed my kids in the car. Let your kids get dirty and get dirty yourself! Have fun! So now your turn...have you ever been? Or how do you let your kids get dirty?